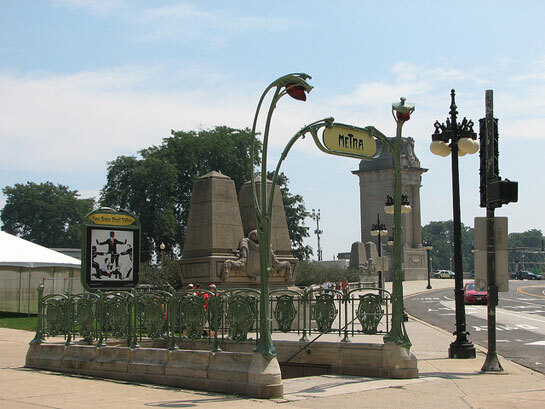 We came across this Paris-style Metra entrance in Chicago the other day. 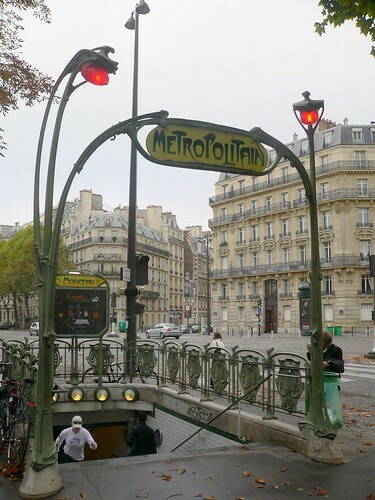 It is based on the famous Art Nouveau Metro entrances by Hector Guimard. The entrance to the Van Buren station was given to Chicago by the city of Paris in 2001. The cast iron entrance was taken from the original molds. Here is the original in Paris (photo by adfoto), which was introduced to Paris in the early 1900s. There is also one in Montreal. I wonder if there are any anywhere else. This entry was posted on Thursday, August 5th, 2010 at 3:13 am CET and is filed under Art, Chicago	with tags . You can follow any responses to this entry through the RSS 2.0 feed. You can leave a response, or trackback from your own site. Interesting! I’ve never noticed this before. I’ll have to stop by and have a look. There is one in mexico city. France gave a few away as gifts to other nations. there is one in Lisbon,Portugal at picoas station.